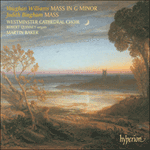 The Te Deum in G was set by Vaughan Williams in 1928. 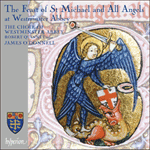 Commissioned for the enthronement of Cosmo Lang as Archbishop of Canterbury on 4 December, this latter piece rolls with confidence from the outset, a strong declamatory unison leading to an antiphonal representation of the angelic chorus before the opening material is transformed into a prayerful, supplicatory ending. 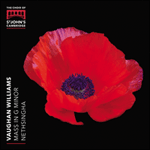 Le Te Deum in G, mis en musique par Vaughan Williams, fut commandé pour l’intronisation de Cosmo Lang à la dignité d’archevêque de Cantorbéry, le 4 décembre 1928, cette pièce retentit de confiance, d’emblée: un puissant unisson déclamatoire débouche sur une représentation antiphonée du chœur angélique, avant que le matériau d’ouverture ne soit mué en une conclusion déprécatoire, suppliante. 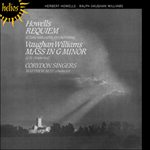 Im 1928 komponierte Vaughan Williams das Te Deum in G. Dieses letztere Werk wurde anlässlich der Inthronisation von Cosmo Lang als Erzbischof von Canterbury am 4. Dezember in Auftrag gegeben und kommt von Anfang an sehr selbstbewusst daher; ein starkes deklamatorisches Unisono führt zu einer antiphonischen Darstellung des Engelschors bevor das Anfangsmaterial in ein bittendes, flehendes Ende umgewandelt wird. We praise thee, O God: we acknowledge thee to be the Lord. All the earth doth worship thee: the Father everlasting. Heaven and earth are full of the Majesty: of thy glory. The glorious company of the Apostles: praise thee. The goodly fellowship of the Prophets: praise thee. The noble army of Martyrs: praise thee. Thine honourable, true: and only Son; Also the Holy Ghost: the Comforter. Thou art the King of glory: O Christ. Thou art the everlasting Son: of the Father. O Lord, save thy people: and bless thine heritage. Govern them: and lift them up for ever. Vouchsafe, O Lord: to keep us this day without sin. O Lord, have mercy upon us: have mercy upon us.